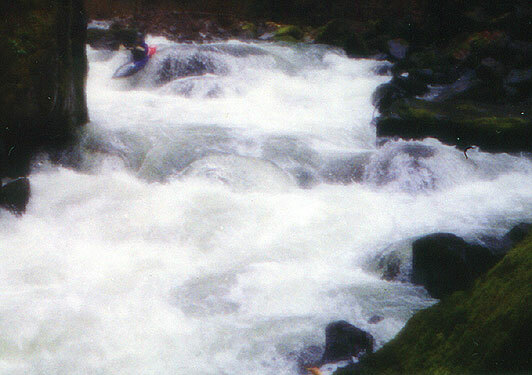 Copeland Creek is one of the best class four runs in Oregon. This creek has a wide variety of boulder gardens, slides, and one big ledge. 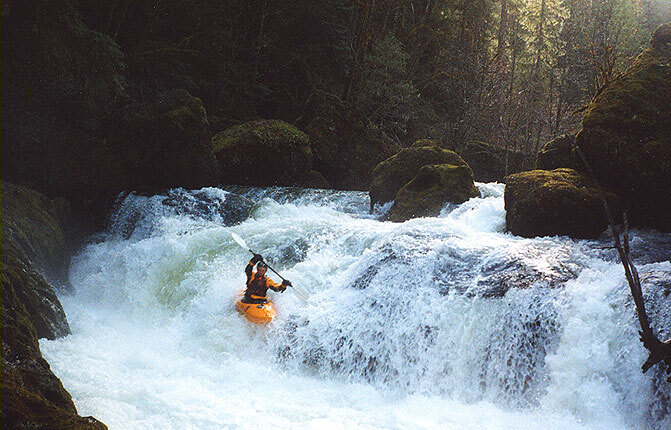 Copeland tumbles down through a wide, scenic gorge into the North Umpqua river at a steady 120 fpm gradient that keeps boaters quite busy, though there is plenty of time to soak up the scenery between each great rapid. We put in at Camp Wobegone and after a few fun drops we got out and portaged Paul Bunyan Falls- I don't think that thing is runnable at any flow with all the wood in it. It is easy to see this drop from upstream as the creek divides around an island. Stay right and portage on that side. I am always frustrated by the wood at Paul Bunyan, but this creek provides plenty of excitement downstream! A hundred yards downstream is Sneaky Snake, a rather dangerous ledge that we run far left. Once again we did a partial portage on the right side to avoid the do or die move above the worst part of the hydraulic. Mike and Tim clambered over the large boulders while I found a cave under the jumble of boulders that didn't have too much water flowing through it and crawled through. I called this the 'sapper route' The hole was just big enough to pull my boat through and I avoided the scramble- this route would be closed at higher water, but at this flow it was pretty nice. Below Fountain are some of the biggest and most technical rapids. 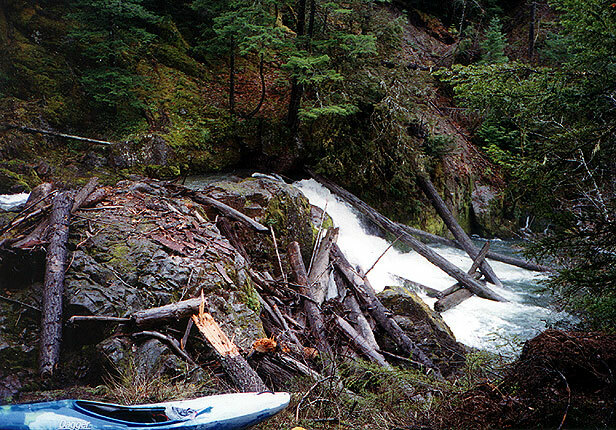 Some of these rapids can be quite challenging, especially at higher flows. In the rapid pictured below I went first and discovered the hard way why the boof move on the right is the best way to go- I smashed into a submerged rock so hard in the river left chute that my back still hurts. Mike and Tim (pictured in midair) saw that and opted for the right side boof. 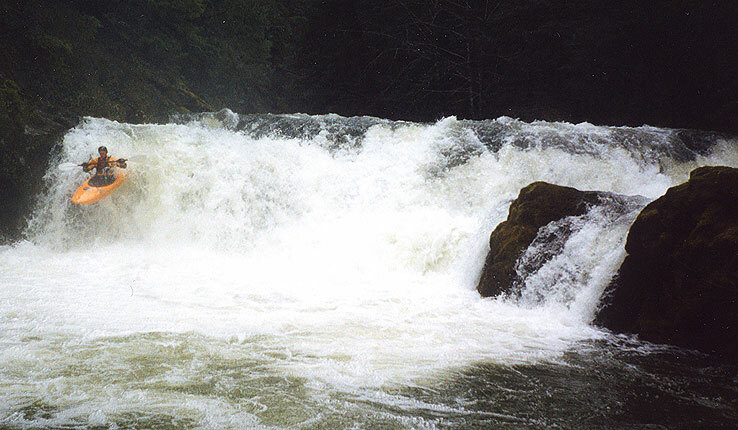 Flows: The photos on this report were taken at around 7.5 feet on Pat Welch's North Umpqua at Glide gauge on Pat Welches website. Seven to nine feet is fine for most class IV boaters. This run gets really exciting above 10 feet, though only skilled boaters should attempt the creek at that flow as the overall difficulty jumps to V- and it starts to get pushy! Access: The take-out is the Copeland Creek bridge on Oregon 138, approximately 48 miles east of Roseburg. To reach the put in, drive upstream on FS 28 about 2.5 miles until the next bridge. Turn right before the bridge and drive upstream on Copeland Creek Road (FS 2801) another 2.5 miles. Turn left onto FS 300. Cross the creek and park at the 'Camp Wobegone' hunters camp, the put-in. There are two ways to access Copeland Creek from the North. The first is to take the loooong trip down I5 to Roseburg and then cut over to the east, or you can take one of two short cuts described below. Be advised that the route over the mountains gets snowed in during the winter. These directions were emailed to me by a local paddler. Thanks! The balance of this email describes two routes from Portland to the North Umpqua without going through Roseburg. Each of these routes is shorter and faster than driving through Roseburg. Although the second route is 30 miles shorter than the first, it takes about the same amount of time (as it climbs up over a mountain). On the second route, there is a great view at the "Y" in the road described below. 1. Driving south on I-5, when about 15 miles north of Roseburg take the last Sutherlin exit, cross to the east side of I-5, and then turn south on the road that parallels I-5. Drive less than a handful of miles through Wilbur and then turn left (east) onto North Bank Road (at this road there is a sign on the left side of the highway). From there it is 17 miles to Hwy 138 (the road that follows the North Umpqua up river from Roseburg). Where you hit Hwy 138 you are a few miles downstream of Glide. At Hwy 138, turn left and proceed up the North Umpqua towards Steamboat. Gravel Bin is just past Steamboat. 2. The second shortcut is also paved and shown on the official highway map of Oregon. Driving south on I-5, when about 10 miles north of Roseburg take Exit 135 marked "Wilbur." Cross I-5 to the east side of the freeway, and turn south on the road that parallels I-5. Drive about 3.5 miles through Wilbur and then at the Mini Mart turn left (east) onto North Bank Road (at this road junction there is a sign for North Bank Road on the east side of the highway). From there it is 17 miles to Hwy 138 (the North Umpqua Road from Roseburg). Where you hit Hwy 138 you are a few miles downstream of Glide. Note for returning that where you come into Hwy 138 that you are at Milepost 15 (on the North Umpqua Highway from Roseburg) and that in addition to the milepost there are signs you will see upon returning saying: "Wilbur 17" and "N. Bank Road." At Hwy 138, turn left and proceed up the North Umpqua towards Glide, Steamboat, and Diamond Lake. The takeout for the run down from Horseshoe Bend Campground is less than a mile upstream from Milepost 39 where Steamboat Creek enters the North Umpqua and is marked with a sign: "Gravel Bin Raft Takeout." Other Data: This creek was first run by Kevin Schrier, Jason Bates, and Michael Primeaux in December 1996 at 300-500 cfs.